WILLEMSTAD – Prime Minister Hensley Koeiman and his government should ask the Advisory Council (RvA) to investigate whether the accession of the seven Members of Parliament last week Wednesday took place according to the parliamentary rules and regulations or not. This request was made by the nine MPs who called themselves the majority early last week when there were only 14 MPs in parliament. The group of nine based their request on Article 47 of the Constitution. The letter was also sent to the Governor of Curaçao and the Supreme Electoral Council (SEC). The group of nine MPs consist of the factions of the opposition parties Movement for the Future of Curaçao (MFK) of former Prime Minister Gerrit Schotte, Kòrsou di Nos Tur (KdNT) of business man Amparo dos Santos, Movementu Progresivo (MP) of Dr. Marilyn Moses and the Independent MP Edward Braam. 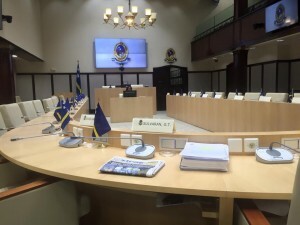 The group is seriously considering whether or not they will participate in public meetings of the parliament depending on the answer they receive from the government or the RvA.